As of 2019, every single model that rolls off our assembly line will come standard with a Veranda Luxury Pontoons Performance Package, which includes hydraulic tilt steering, lifting strakes and Hyper-Lift®-style performance motor pod. The VP and Vertex series include 27” triple-toons while the Relax and Fish series include 25” or 27″ triple-toons. The trifecta of components provides superior performance that allows you to outperform the competition. Whether your application calls for small or large power, you can be assured your Veranda is maximizing your boating investment. 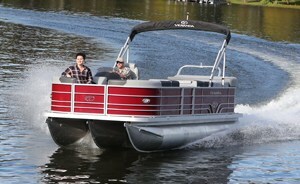 Veranda Luxury Pontoons will give you the quality, performance and features you demand. All you have to do is add water. 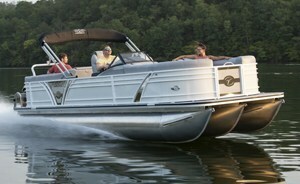 Veranda Luxury Pontoons Performance Packages are available with 25” diameter or 27” diameter pontoons. These larger diameter pontoons will carry more of your friends and family as well as that larger horsepower engine you have been longing for. 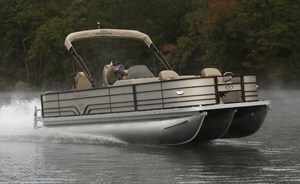 Veranda Luxury Pontoons Performance Packages include four lifting strakes and our exclusive Hyper-Lift® style engine pod running surface to create superior bow lift. These features, in combination with VLP’s patented integrated wave shield design, reduce water resistance putting your Veranda out ahead of the competition in speed, fuel efficiency, and ride quality. 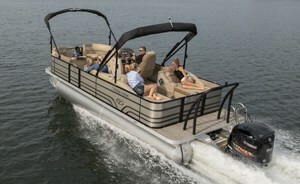 Veranda Luxury Pontoons Performance Packages are equipped with UFLEX hydraulic steering and can be upgraded to the ULTRAFLEX Power Steering making handling the tightest of turns easy for any member of the family. Veranda Luxury Pontoons Performance Packages in combination with our Patented Aluminum Interlocking Deck System, and Yamaha outboards turn-key reliability and efficiency, ensure you will be out in front. Don’t just take our word for it, schedule your test drive today by contacting your nearest dealer.